BlizzCon is an annual gaming convention held by Blizzard Entertainment to promote its major franchises Warcraft, StarCraft, Diablo, Hearthstone, Heroes of the Storm and Overwatch. 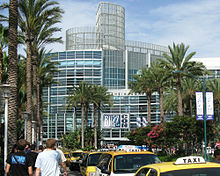 The first BlizzCon was held in October 2005 and since then all of conventions have been held at the Anaheim Convention Center in Anaheim, California, in the same metropolitan area as Blizzard's headquarters in Irvine. The convention features game-related announcements, previews of upcoming Blizzard Entertainment games and content, Q&A sessions and panels, costume contests and playable versions of various Blizzard games. The closing night has featured concerts by The Offspring, Tenacious D, Foo Fighters, Ozzy Osbourne, Blink-182, Metallica, Linkin Park, "Weird Al" Yankovic, and Muse. A similar event was the Blizzard Worldwide Invitational, held outside the U.S. from 2004–2008. Tickets for the first BlizzCon were US$50 for admission to both days of activities. For the 2007 and 2008 events, prices were $100. In 2009, the price was raised to $125. For 2010, the price was raised to $150. For 2011, the price was raised to $175 and for 2013 the price remained at $175. For 2014, the price was raised to $199 and the BlizzCon Benefit Dinner went from $500 to $750, which includes admission. From 2015 to 2018, the prices have remained at the 2014 level. The ticket price includes a goody bag that contains items such as in-game prizes, beta keys for upcoming Blizzard games and exclusive Blizzard paraphernalia. BlizzCon was not held in 2006 or 2012. Attendees were able to try one of the two new playable races, the Blood Elves, for upcoming expansion based in Outland which was released as World of Warcraft: The Burning Crusade in 2007. Playable demos of the single and multiplayer modes of the since cancelled Starcraft: Ghost were available. A songwriting competition was judged by Jonathan Davis of Korn. Level 60 Elite Tauren Chieftain, comedian Christian Finnegan, and The Offspring performed at the closing concert. StarCraft II was available for play, as single player or 2v2 as Terran or Protoss. Much of the game was revealed and explained as well as Q&A with attendees. The Zerg race was, however, not unveiled at that time. The second expansion to World of Warcraft, titled Wrath of the Lich King, was officially announced and it was available to play. Comedian Jay Mohr entertained at the closing ceremony followed by Level 70 Elite Tauren Chieftain (who changed their name to reflect the new level cap in The Burning Crusade) alongside Video Games Live performing at the closing concert. In the opening ceremonies, Blizzard president Michael Morhaime revealed the third playable class for Diablo III: the Wizard, as well as the major announcement that Starcraft II would be separated into three games. Playable versions of Diablo III, StarCraft II, and World of Warcraft: Wrath of the Lich King were available to test during the convention. As well, there were tournaments and competitions for the World of Warcraft Trading Card Game, World of Warcraft miniatures game, StarCraft, StarCraft II, Warcraft III: The Frozen Throne, and World of Warcraft arena. The Zerg race was now playable in the StarCraft II demos. BlizzCon 2008 was broadcast live on both days as a PPV event on DirecTV for US viewers only, for eight hours per day in high definition. Official Blizzard fansite WoW Radio broadcast live audio via SHOUTcast. For the closing ceremonies on Saturday, comedians Kyle Kinane and Patton Oswalt performed. The closing concert was performed by Video Games Live, playing arrangements from all of the Blizzard games, and a performance including the Wrath of the Lich King music. 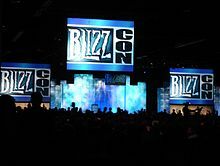 In an attempt to reduce frustrations linked to lack of ticket availability for previous BlizzCons, there were four halls (increased from three) of space available. Blizzard implemented a new system designed to make buying tickets easier. The new system implemented an online queue, effectively creating an organized online "line" for anyone who wants to purchase tickets, an improvement on 2008's chaotic sale of tickets. As in 2008, DirecTV carried both days of BlizzCon 2009 as a PPV event ($39.95 for both days) for eight hours per day in both standard and high definition. All BlizzCon 2009 Pay Per View event purchasers received an exclusive "Grunty the Murloc Marine" World of Warcraft in-game pet. and had access to the online stream for no additional cost. New in 2009, BlizzCon was broadcast live via an internet stream, calling it a "Virtual Ticket". The site covered both days of the convention featuring exclusive interviews and commentary, main stage presentations including the opening ceremony and tournament coverage with team highlights. All purchasers received an exclusive "Grunty the Murloc Marine" World of Warcraft in-game pet. The third expansion, World of Warcraft: Cataclysm was announced. Diablo III, StarCraft II: Wings of Liberty were available to play. Ozzy Osbourne performed for the closing concert. The fifth playable Diablo III class was revealed to be the Demon Hunter and the StarCraft II modification called "Blizzard DotA" was presented, which later evolved into Heroes of the Storm. Diablo III, StarCraft II: Wings of Liberty and World of Warcraft: Cataclysm were playable. Similar to 2009, BlizzCon 2010 was available live via an online broadcast on the "BlizzCon Virtual Ticket". The Virtual Ticket provided four live feeds from the convention floor, offering 50+ hours of HD BlizzCon programming. DirecTV again offered both days of BlizzCon 2010 as a PPV event ($39.95 USD for both days) for ten hours per day in both standard and high definition. Korean pro-gamer MVP_Genius won the StarCraft II Blizzcon Invitational. The vinyl record Revolution Overdrive: Songs of Liberty was released for the event. Tenacious D (Jack Black/Kyle Gass) played for the closing concert with Dave Grohl. Recordings of the event were released for free as part of the Live Music Archive. The opening ceremony showcased a new Diablo III cinematic trailer titled "The Black Soulstone", a StarCraft II: Heart of the Swarm reveal trailer showcasing new units and abilities, a "Blizzard DOTA" trailer for a new game made from StarCraft II and the reveal of World of Warcraft: Mists of Pandaria, a new expansion for World of Warcraft. Diablo III, StarCraft II: Heart of the Swarm, and World of Warcraft: Mists of Pandaria were playable. DirecTV once again offered both days of BlizzCon 2011 as a PPV event. The GOMTV Global Starcraft II League October final match took place in Anaheim alongside BlizzCon. Moon "MMA" Sung Won beat Jeong "Mvp" Jong Hyeon, 4-1. The closing concert featured a performance from Blizzard's own in-house band, The Artist Formerly Known as Level 80 Elite Tauren Chieftains (TAFKL80ETC), who changed their name mid-concert to Level 90 Elite Tauren Chieftains (L90ETC). The Foo Fighters performed for the closing concert. Blizzcon 2013 was announced to be held on November 8 and 9 in Anaheim. The tickets were sold in two batches, on April 24 and 27, 2013, and both batches quickly sold out. Blizzard also sold special tickets that include access to a pre-Blizzcon Benefit Dinner. These limited tickets cost $500 each, with all money collected from the pre-Blizzcon Benefit Dinner being donated to Children's Hospital of Orange County, CA. Blizzard once again sold a Virtual Ticket for live online streaming of all of the events in BlizzCon 2013. The Heroes of the Storm "Cinematic Trailer" was presented with an alpha version of the game available for playing. Hearthstone's' was announced to begin beta testing and that the game would be released on iOS and Android. The fifth expansion to World of Warcraft, Warlords of Draenor, was officially announced and a trailer was shown. The Warcraft film concept art was shown. Diablo III: Reaper of Souls was announced to be released on PC and PS4. The gaming events included the finals of the 2013 StarCraft II World Championship Series as well as the Hearthstone Innkeeper's Invitational, a Hearthstone: Heroes of Warcraft tournament featuring a handful of prominent Twitch.tv streamers. The StarCraft II competition was won by Kim "sOs" Yoo-jin, World of Warcraft arena was won by team Skill-Capped and Hearthstone was won by Dan "Artosis" Stemkoski. The closing concert was performed by Blink-182. Life won the BlizzCon 2014 StarCraft II tournament. The tickets went on sale May 7 and 10, 2014. In addition, a limited number of tickets went on sale May 15 for $750 with proceeds benefiting Children's Hospital of Orange County, this included admission. For 2014, tickets were sold via Eventbrite instead of the Blizzard Store. Blizzard once again sold a Virtual Ticket for live online streaming of all of the events. Overwatch, a new class-based multi-player shooter, was announced on November 7, 2014. The third part of Starcraft II, Legacy of the Void was announced. The first expansion pack for Hearthstone, Goblins vs. Gnomes, was also announced on the same day. The first Hearthstone World Championship was hosted at the event. The 2014 StarCraft II World Championship Series Global Finals was won by Lee "Life" Seung Hyun beating Mun "MMA" Seong Won. The World of Warcraft championship was won by team Bleached Bones. Hearthstone was won by James "Firebat" Kostesich and first official tournament in Heroes of the Storm was held at the event that was won by team Cloud 9. The closing ceremony concert was opened by Level 90 Elite Tauren Chieftains (changed their name during the show to Elite Tauren Chieftains) and closed by Metallica. For details about the Heroes of the Storm World Championship, see 2015 Heroes of the Storm World Championship. The tickets went on sale on April 15 and 18 using Eventbrite, and were sold out nearly instantly. Blizzard once again sold a Virtual Ticket for live online streaming of all of the events held at BlizzCon. The convention's online broadcast was watched by over 10 million people. Hearthstone's third adventure, League of Explorers, was announced on November 6, 2015, which was later released on November 12. Overwatch was announced to have a Q2 2016 release date, later confirmed for May 24. The expansion World of Warcraft: Legion released its cinematic trailer and announced a release date on or before September 21, 2016 and was playable. The Warcraft (film) released its first official trailer and revealed its release date of June 10, 2016. StarCraft II was announced to have upcoming single player mission packs, Nova Covert Ops, which each consist of three missions. The 2015 Heroes of the Storm World Championship and the second Hearthstone World Championship were hosted at the event. Hearthstone was won by Sebastian "Ostkaka" Engwall and Heroes of the Storm was won by team Cloud 9 again. The 2015 StarCraft II World Championship Series Global Finals was won by Kim "sOs" Yoo-jin beating last year's winner Lee "Life" Seung Hyun and becoming the first two-time StarCraft II World Championship Series world champion. The World of Warcraft arena team championship was won by SK Gaming. The closing concert was performed by Linkin Park. Blizzcon 2016, also known as BlizzCon X, was the tenth BlizzCon event. Its tickets were sold on April 20 and 23 using the ticketing service Universe. Blizzard offered a Virtual Ticket for live online streaming of all of the esports events and major panels, remaining at the $39.99 price. Other panels and interviews in smaller rooms were not included for streaming. In September 2016, Blizzard Entertainment released a sneak peek at the BlizzCon 2016 in-game item rewards and offered for the first time the "goody bag", normally only for physical attendees, was offered for sale to virtual ticket holders. The fourth expansion for Hearthstone, Mean Streets of Gadgetzan, was announced on November 4, 2016, and was later released on December 1, 2016. Overwatch officially announced the hero Sombra, Blizzard announced the creation of an official esports league for Overwatch. It was announced that Diablo III would include a remake of Diablo and the necromancer hero class would be added in a DLC. The gaming events at BlizzCon 2016 included the 2016 StarCraft II World Championship Series Global Finals won by Byun "ByuN" Hyun Woo, the World of Warcraft arena championship, the Hearthstone third world championship, the Heroes of the Storm fall championship, and the Overwatch World Cup. Kristian Nairn, who played Hodor on the HBO series Game of Thrones, was the DJ during Blizzard's 25th anniversary party. The closing ceremony concert was performed by "Weird Al" Yankovic. On March 14, Blizzard Entertainment announced that BlizzCon 2017 was held on November 3 and 4, with tickets being available to purchase on April 5 and 8 using the ticketing service Universe; an unprecedented third round happened on July 5 due to the convention center adding a new hall. The prices for both admission and the benefit dinner remained at $199 and $750 respectively. On September 13, 2017, Virtual Tickets began being sold; this ticket included a faction-specific flying mount in World of Warcraft, and other special items in the various Blizzard games. Blizzcon 2017 had a record number of more than 35,000 attendees due to a recently completed expansion of the Anaheim Convention Center. At Blizzcon the gaming announcements included that the next expansion to World of Warcraft would be Battle for Azeroth, there would be official World of Warcraft Classic servers, a new hero for Overwatch named Moira was added as well as a new map called "Blizzardworld", StarCraft II: Wings of Liberty's first campaign, multiplayer and other modes of the game are now free, and Hearthstone's next expansion would be "Kobolds and Catacombs" and that it would be released in December 2017. The esports events at BlizzCon 2017 included the 2017 StarCraft II World Championship Series Global Finals won by Lee "Rogue" Byung Ryul, the World of Warcraft arena championship won by ABC, the Hearthstone Inn-vitational won by the Grimestreet Grifters, the Heroes of the Storm HGC Finals won by MVP Black, the Overwatch World Cup won by South Korea for the second time, and StarCraft: Remastered Ultimate Title Fight won by Bisu. The closing concert was performed by Muse. Blizzard Entertainment announced that BlizzCon 2018 would be held on November 2 and 3 at the Anaheim Convention Center, with tickets being available to purchase from Universe.com on May 9 and 12. A third round of tickets went on sale on August 18. The price for admission remained at $199 while a virtual ticket option was offered for $49.99. The announcements on the first day included Warcraft III: Reforged, a remaster of Warcraft III: Reign of Chaos and its expansion, The Frozen Throne, with a release sometime in 2019; Ashe, a new Western-themed hero for Overwatch; Orphea, daughter of the Raven Lord, the first original character for Heroes of the Storm, who will be given free to attendees and Virtual Ticket holders; the Rastakhan's Rumble expansion for Hearthstone; World of Warcraft Classic, which had a playable demo available for both attendees and Virtual Ticket holders, will be released in the summer of 2019, and will be included in the regular World of Warcraft subscription; and Diablo: Immortal, an action role-playing game for mobile devices. The announcement of Diablo: Immortal was poorly received by attendees and Blizzard fans across the board, resulting in a high number of dislikes on the Youtube gameplay and cinematic trailers, and considerable criticism from gaming journalists, streamers and Youtubers. The esports events at BlizzCon 2018 included the StarCraft II World Championship Series Global Finals won by Joona "Serral" Sotala, the World of Warcraft Arena World Championship won by Method Orange, the World of Warcraft Mythic Dungeon Invitational All-Stars won by Free Marsy, the Hearthstone Global Games won by the China team, the Heroes of the Storm Global Championship won by Gen.G, and the Overwatch World Cup won by South Korea for the third time. Closing festivities included three simultaneous concerts by Train, Kristian Nairn, and Lindsey Stirling. Blizzard WorldWide Invitationals were events similar to BlizzCon held outside the United States. 1 January 15 to 18, 2004 Seoul, South Korea, COEX Convention Center Free None ? ? ? ^ "BlizzCon 2013 Tickets On Sale April 24 and 27". Blizzard Entertainment. April 4, 2013. Retrieved April 4, 2013. ^ a b "BlizzCon 2014 Conquers Anaheim November 7 and 8". Blizzard. April 22, 2014. Retrieved April 22, 2014. ^ "2012 Battle.net World Championship Event". Blizzard Entertainment. January 25, 2012. Retrieved January 26, 2013. ^ "20,000 tickets sold for BlizzCon 2009; sold out in just eight minutes". Retrieved October 28, 2014. ^ "Legendary Game Universes and Esports Superstars Take Center Stage at BlizzCon® 2018". November 4, 2018. Retrieved November 6, 2018. ^ "ACTIVISION BLIZZARD ANNOUNCES THIRD-QUARTER 2018 FINANCIAL RESULTS". Retrieved November 15, 2018. ^ "Protoss vs. Terran: Match-up Analysis". GameReplays. August 5, 2007. Retrieved December 25, 2007. ^ "Terran vs. Protoss: Match-up Analysis". GameReplays. August 5, 2007. Retrieved December 25, 2007. ^ "Blizzcon 2007 announced" (Press release). Blizzard Entertainment. Archived from the original on August 19, 2007. Retrieved August 3, 2007. ^ "World of Warcraft: Wrath of the Lich Ling unveiled" (Press release). Blizzard Entertainment. August 3, 2007. Archived from the original on August 20, 2007. Retrieved August 3, 2007. ^ "BlizzCon 2007 Gaming Festival to Feature Comedian Jay Mohr" (Press release). Blizzard Entertainment. Archived from the original on August 20, 2007. Retrieved August 3, 2007. ^ "BlizzCon". October 24, 2014. Retrieved October 28, 2014. ^ BlizzCon 2009 Ticket Sales are Done WoW Insider June 1, 2009. ^ "DirecTV Blizzcon". DIRECTV. Retrieved October 28, 2014. ^ "Ozzy Osbourne to Headline BlizzCon Concert". Kotaku.com. August 11, 2009. Retrieved February 26, 2013. ^ [ "BlizzCon 2010 StarCraft II Blizzcon Invitational] - Liquipedia - The StarCraft II Encyclopedia". wiki.teamliquid.net. ^ "Tenacious D Live Onstage at BlizzCon 2010". ^ "Tenacious D : Free Music : Free Audio : Download & Streaming : Internet Archive". Retrieved October 28, 2014. ^ "GSL October Final in Anaheim". ^ "FOO FIGHTERS TO ROCK THE HOUSE AT BLIZZCON 2011". Retrieved October 28, 2014. ^ "Blizzard Entertainment's Blizzcon 2013 Storms Anaheim November 8 and 9" (Press release). Blizzard Entertainment. February 19, 2013. Retrieved February 19, 2013. ^ "Second Batch of BlizzCon Tickets Sold Out". Blizzard Entertainment. April 27, 2013. Retrieved April 28, 2013. ^ "Blizzcon 2013, Tickets available April. World of Warcraft, Starcraft II, Titan". NeedToSee. April 4, 2013. Archived from the original on April 12, 2013. Retrieved April 5, 2013. ^ "BlizzCon Benefit Dinner Tickets Sold Out". Blizzard Entertainment. May 1, 2013. Retrieved May 2, 2013. ^ "BlizzCon 2013 Virtual Ticket On Sale Now". Blizzard Entertainment. September 12, 2013. Retrieved October 15, 2013. ^ "Mike Morhaime talks about the BWC, HoTs, 2013 Blizzcon, and more". GameSpot.com. November 18, 2012. Retrieved February 26, 2013. ^ "Hearthstone Innkeeper's Invitational". Blizzard. October 10, 2013. Retrieved October 15, 2013. ^ "SoCal Punk Legends Blink-182 to close out Blizzcon 2013". Blizzard. October 31, 2013. Retrieved October 31, 2013. ^ "BLIZZCON 2014: BLIZZARD'S NEW GAME IS 'OVERWATCH'". ign.com. Retrieved November 7, 2014. ^ "Hearthstone's new expansion, Goblins vs. Gnomes, to add 120 cards in December". Pocket Gamer. November 7, 2014. ^ "Metallica Performing Live at BlizzCon® 2014". Blizzard. October 21, 2014. Retrieved October 21, 2014. ^ New Hearthstone Expansion The League of Explorers Announced Retrieved November 6, 2015. ^ Linkin Park to Bring Down the House at BlizzCon 2015 Retrieved October 21, 2015. ^ "Get a Sneak Peek at the BlizzCon 2016 In-Game Goodies 2016". blizzcon.com. Retrieved September 17, 2016. ^ Mean Streets of Gadgetzan~Now Available Retrieved December 12, 2016. ^ "BlizzCon 2016: Kristian Nairn (Hodor) Will DJ The Anniversary Party - Geek Girl Authority". October 28, 2016. ^ "Another Chance At Tickets For BlizzCon® 2017— On Sale July 5!". blizzcon.com. Retrieved June 30, 2017. ^ "BlizzCon 2017 Virtual Ticket On Sale". Wowhead. Retrieved September 13, 2017. ^ "BlizzCon® 2017 In-Game Bonus Items Incoming!". Blizzard Entertainment Inc. Retrieved November 7, 2017. ^ "These BlizzCon 2017 photos show what it's like when 35,000 cosplayers, fans descend on Anaheim". Orange County Register. Retrieved November 6, 2017. ^ Haywald, Justin (November 4, 2017). "Starcraft 2 Dev On The Effects Of Going Free-To-Play". Gamespot. Retrieved November 4, 2017. ^ "Join Us At BlizzCon 2017". blizzcon.com. Retrieved October 5, 2017. ^ "BlizzCon 2018 Announced - November 2 & 3". hearthpwn.com. Retrieved April 11, 2018. ^ "BlizzCon® 2018 – Third Ticket Sale August 18 at 10 A.M. PT". BlizzCon.com. Blizzard Entertainment. August 16, 2018. Retrieved August 25, 2018. ^ "BlizzCon 2018 Virtual Ticket - BlizzCon". Retrieved November 4, 2018. ^ [ "Warcraft III: Reforged]". playwarcraft3.com. ^ [ Hussain, Tamoor (November 2, 2018). "Overwatch's New Character Hero Ashe Revealed As 29 At BlizzCon]". ^ [ "Heroes of the Storm adds its first original character: Orphea]". November 2, 2018. ^ [ "Hearthstone's Hearthstone's next expansion is Rastakhans Rumble]". November 2, 2018. ^ [ "World of Warcraft on Twitter: World of Warcraft Classic is coming summer 2019, and will be included in your #Warcraft subscription.]". Twitter. ^ [ Kain, Erik. "The 5 Biggest Problems With This 'Diablo Immortal' Fiasco.]". ^ "Schedule - BlizzCon 2018". Retrieved November 4, 2018. 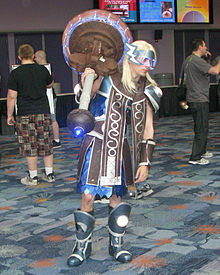 Wikimedia Commons has media related to BlizzCon.